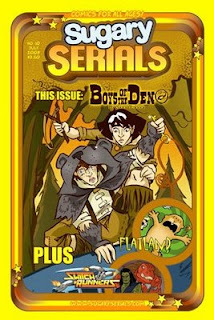 I'm hard at work catching up on getting the final issues of "Season One" of Sugary Serials into print. Just this week, #10 of the series hit the digital shelves over at our IndyPlanet Store. Issues 9 and 10 are especially important to me, as they feature the two-part Switch Runners comic, created by Mark Rudolph and myself. We recorded a bit of an audio commentary track for the comic back in Art & Story 46, where we detailed the challenges presented to us through a unique workflow we developed in the story's execution. I'm also really proud of the sound design I did in this one, if I do say so myself. As a final "advertisey" word on this, the print edition also has a "Back of the Box" fun and games page, and links to exclusive content on the Sugary Serials website. Fun for young or young-at-heart comics enthusiasts.